Foot operated drum kit for guitar players. Be your own one man band with this kit containing a Skinny Bass Drum, Snare Drum, Snare Riser Stand and Drum Stick Beater. This Pro kit will handle any size gig big or small. Buy the complete package including the 6″ x 22″ Pro Skinny Bass Drum with the double heads, Keller maple shells, Evans heads, nice hardware, 6″ x 14″ snare drum and the Snare Kick Riser Stand, Drum Stick Beater and save (pedals sold separately). This is our Pro line kit for the gigging musician who needs to add percussion to their music with their feet. 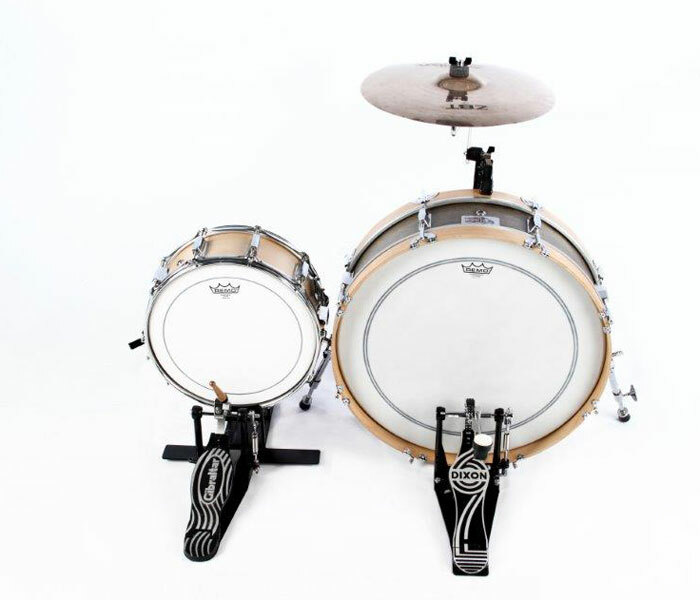 Start your own one man band with our Acoustic foot operated drum pack by Side Kick Drums. Ebony Pro Bass and maple snare drum (specify if you’d like ebony). Also available in burnt orange or red mahogany finish. Specify in order notes for color options. Hoop mounted cymbal and pedals sold separately. Check out our demo video to see it in action.